My MLTL speakers project with Jordan JX92 was waiting for a final touch with some paint or veneer, but instead it ended up with HiVi Research RT1.3 ribbon tweeters. As good as JX92 are, we all know that there is nothing perfect. It was absurd to think that 4-inch driver is capable of reproducing perfectly the whole range from around 30Hz all the way up to 20kHz. That is why I decided to add ribbon tweeter and improve the high frequencies after I cut the bass port to improve the low frequencies, sacrificing those below 40Hz. The good thing is that I chose project which allows me to add second driver – second generation 35″ MLTL. Although I didn’t use Aurum Cantus G2 as Jim Griffin did, the final result is OK with me for now. 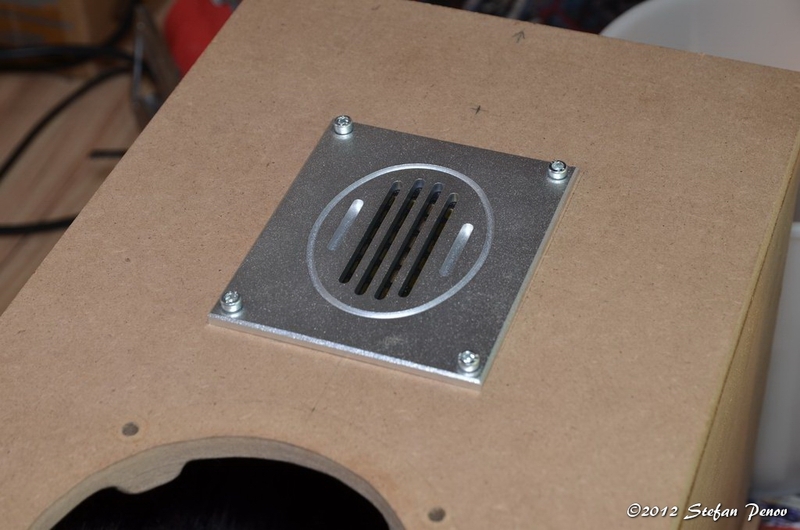 The photo below shows the tweeter already mounted in the speaker. Its front panel isn’t the most beautiful but at least it sounds good. Probably it looks strange that I didn’t use G2 and instead I chose HiVi Research driver. The first reason for my choice is that G2 can be ordered only from USA at this time, which means problems with the customs, long time waiting, paying VAT and taxes. I didn’t like that idea at all. The second reason was the high price of G2, which is even higher than JX92’s. The third reason is that I can not listen to that driver and therefore I have to buy it blindly and if I don’t like it, I should try to sell it which is difficult in Bulgaria. This is why I looked for alternative. After some research I ended my search with RT1.3. Its frequency response according to the manufacturer is almost rectilinear in its usable spectrum. Moreover its price is a few times lower and even if I don’t like it, it’s not a big loss. Additionally I got information that this driver is being used in speakers worth 3000 EUR, which gave me some hope that it deserves a chance. After some consideration I decided to give it a chance and ordered two pieces and some components for cross-overs. This was my first cross-over design and like it often happens it wasn’t as easy as it looks. Thanks to good software and the help of some experienced friends I ended up with the following schematic. 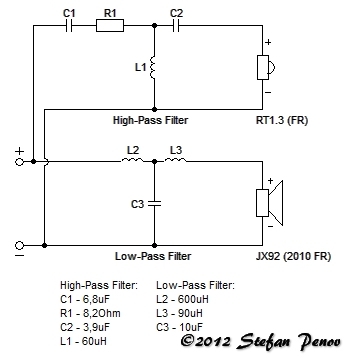 I chose third order cross-overs for both drivers and I added resistor to the tweeter to compensate for its higher sensitivity (92dB compared to 85dB for JX92). I chose non-inductive metal-oxide film resistors and polypropylene capacitors by Mundorf. The inductors I winded up myself. The software gave me the results shown on the charts below. For the calculations I added not only the drivers’ TS parameters, but also their frequency responses. The results are not perfect and probably could be improved. The main target was achieved and it was to make smooth transition between the two drivers while keeping the phase shift as small as possible. Unfortunately I am not able to perform real-world measurements for now. 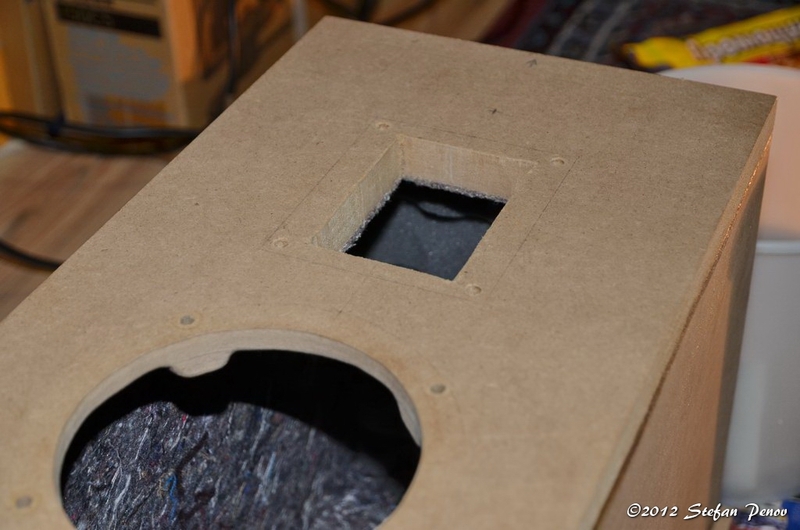 Finishing with the simulations I continued with building the filters and mounting the ribbon tweeters in the speakers. 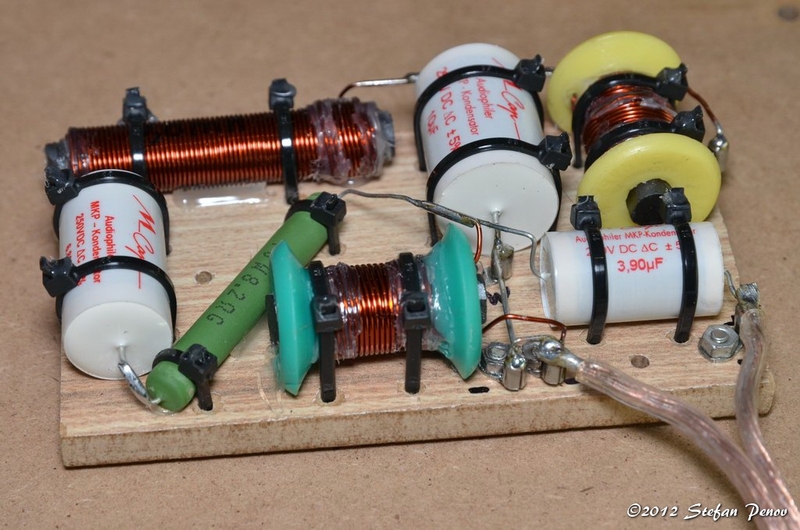 For all inductors I used cylindrical ferrite cores, so I could have low DC resistance. This has many pros and cons, so I will not go into details. All components are mounted on piece of laminate flooring (remaining from the JX92 initial stands) and additionally secured by cable ties and some hot glue. I hope all that will keep the components in place and there will be no problems. With the help of my drill and jigsaw I made the necessary openings for the new drivers. I used T-nuts and bolts (M4 this time) with the right colour to mount the drivers. I already came across problems with ribbon tweeters in the same volume as the woofer and I was not able to put mine in separate volume. I used silicone to seal the back of the RT1.3 drivers. 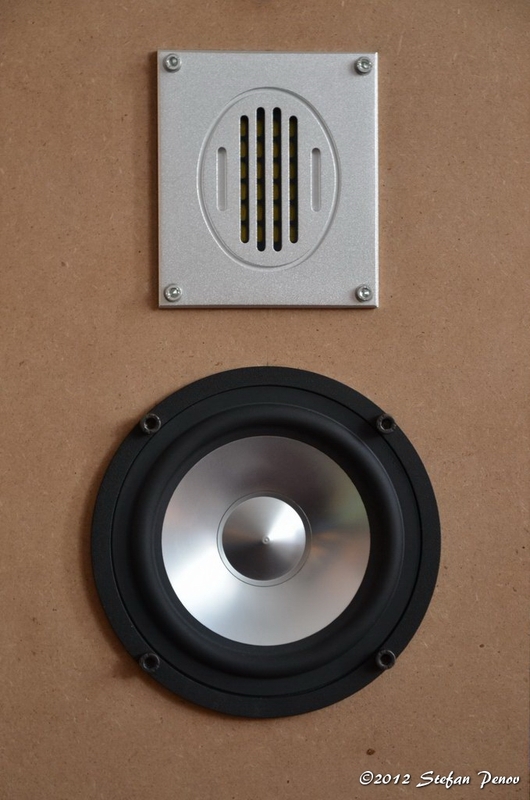 If the drivers are not sealed well enough, some air pushed by the woofer starts to move through them, which causes audible sound distortion. It is possible to cause damage to the tweeters this way. This is all for now. I hope to be able to finish the project soon. Posted on 31.12.2011 20.11.2017 by PenoffPosted in MLTL speakers with Jordan JX92, ProjectsTagged audio, bass reflex, fullrange, Hi-end, HiFi, HiVi, Jordan, JX92s, MLTL, ribbon tweeter.